Shot glasses filled with a dip and topped with crunchy crudites, eggplant and French bean salad, slices of bocconcini sitting pretty atop slices of tomato, an interesting beet and orange salad and eggplant parmagiana. And that was only some of the vegetarian offerings. For meat lovers, there were servings of bacon wrapped around quartered figs, tiny servings of tuna nicoise, parma ham with melon, prawn cocktail salad, scotch egg quarters in a spicy tomato sauce, and the list goes on. Italians consider pranzo or lunch, the most important meal of the day. 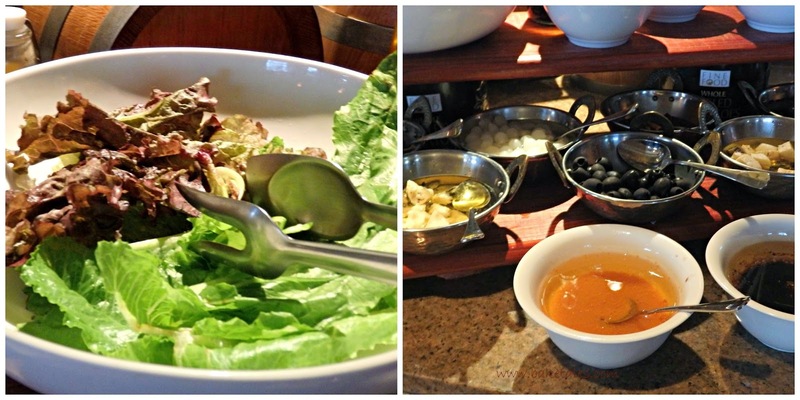 Invited to review Pranzo Saturdays buffet at Focaccia, Hyatt Regency's trattoria style restaurant, my dining companion and I chose a table near the large windows that overlooked the main road. Muted and earthy shades of brown on the walls and floor added to the feeling of warmth and coziness. The restaurant was buzzing with activity - servers bringing food to the tables and diners helping themselves at the buffet service. 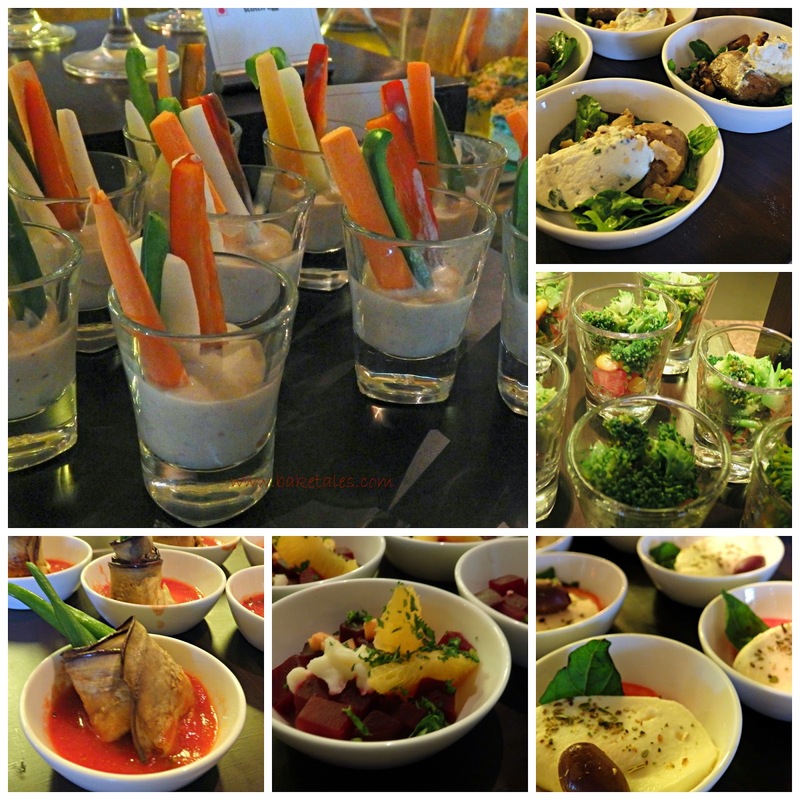 The food was served in courses- primi, secondi and dolci. Self explanatory, I'm sure. The busy kitchen specialises in Southern Italian and Mediterranean food and is helmed by the executive chef whom we couldn't meet that day, executive sous chef Manvinder Singh and chef de cuisine Roberto Zorzoli from Milan. 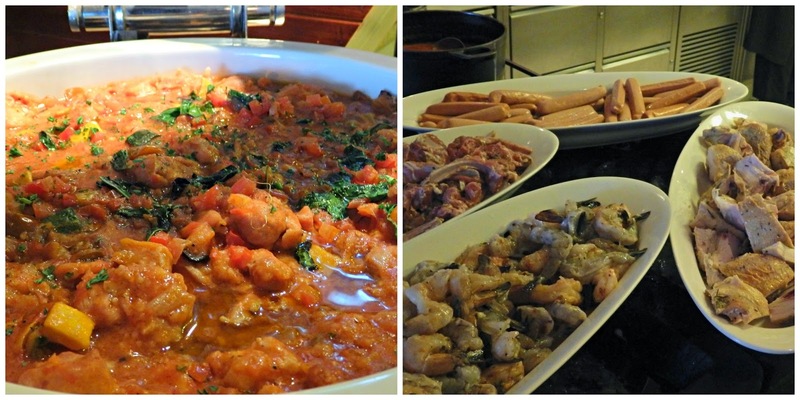 This pranzo did showcase quite a few Italian dishes and the chefs gave us a little tour of the buffet counters. A big wheel of Parmesan dominated the cheese counter; there was also gouda, both plain and spiced. And what's nice was that they were the real deal. The pranzo buffet starts with an aperitivo. Wine, prosecco, beer and sangria are on offer. We chose sparkling wine and that was a good accompaniment to the cheese and breads. And at the non veg section...the only grouse we had was with the smoked salmon. We had a wedge each of a vegetable and a chicken pizza. Baked in the wood fired oven, both slices were delicious. And cheesy. And a wonderful Tuscana tomato soup that had flecks of garlic and basil, was easily the highlight of the meal. We left it to the chef to make us a salad. It was a tall beauty - layered salad greens and tomato slices which had been tossed in a light orange dressing, drizzled with balsamic vinegar and topped with a pat of goat's cheese. And walnut halves. Definitely my kind of salad. Decisions, decisions...was it going to be seafood bolognaise, or a rigatoni lasagna for the first course? Chef Roberto recommended a mushroom risotto. And what a fantastic recommendation. Cooked to perfect al dente, the rice was creamy; the earthy flavour of the chunks of porcini mushrooms was just divine. Incidentally, Chef Roberto specialises in risotto. The vodka marinated shrimp was so fresh and tasted of the sea, the lamb chops with whiskey marination, was tender. The rosemary chicken had just the right amount of rosemary as it is a herb which can dominate if used with a heavy hand. Every one of the meats was perfectly seasoned, nothing detracted from the taste. Just the way I like food to taste- subtly seasoned and full of flavour. We were careful not to stuff ourselves too much as we had peeked at the dessert counter a little earlier. In a word, it was all irresistible. So we decided to pick up one of everything and share it. 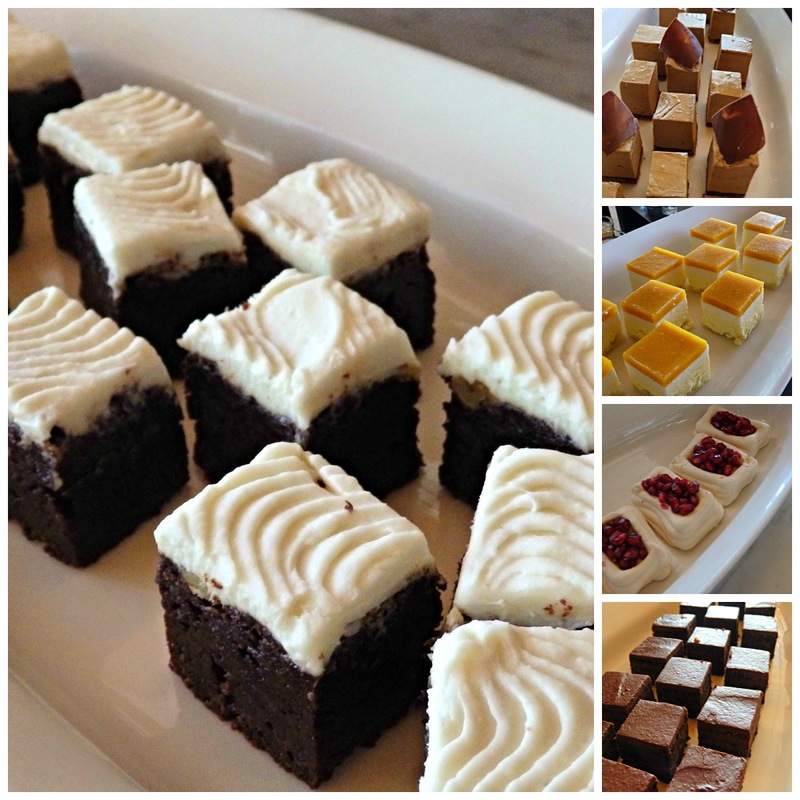 The brownies were heavenly, also the mud cake, baked yoghurt, passion fruit mousse cake and especially the coffee chocolate pot with the interesting additions inside. The pannacotta wasn't set, the litchi mousse, while refreshing, was rather too sweet and the base of the strawberry mousse cake soggy. But the mousse itself was so good. I liked the way individual portions were plated. The chef did ask us if we wanted chilli flakes on any of the food!! Obviously, he's prepared to customise taste to please every kind of palate. Service is unobtrusive yet efficient. Cutlery and plates are changed between courses and the servers are always at hand to attend to your every request. So the next time a Saturday rolls around and you just want to laze the day away, it's a good idea to hit Focaccia for pranzo. And experience a slice of Italy. 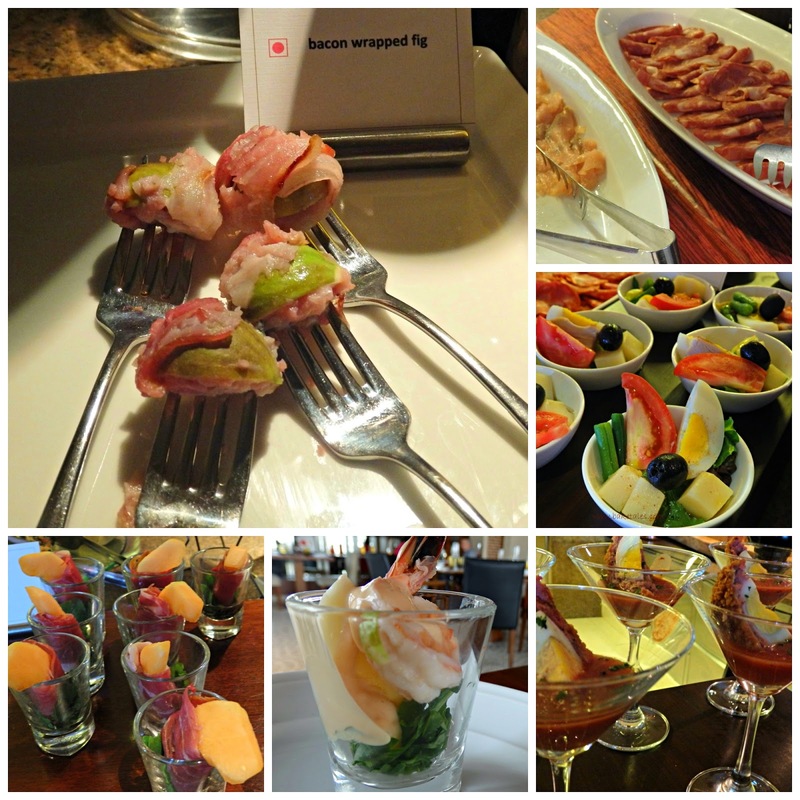 1399/ ++for the non alcoholic buffet, 1699/++ with alcohol. For an extra 500/, you can get to use the pool.